Those look so good! Yum... now, is the picture you posted of YOUR actual cupcakes, or a picture from a cookbook? They look perfect! Feeling.... hungry. Those look like they should be my breakfast! Oh that is like a double naughty whammy! A cupcake and a brownie... Like choco orgasmic... should try it, will try it! Have a fab fab Valentines Day! My family would so love these! Those are so cute! And look great! You know how to get to me, don't you? I just gained five pounds! This is a perfect way to start the day! YUM. I'm really hungry for chocolate cupcakes now. YUM. I'm sure there non fattening with just 3.5 sticks of butter!!! You always post the best recipes. I might give these a go without the hearts. Far too depressing for a single man this time of year. Unless I was to give them to my cat, Mildred. They look so cute and delicious. Those are too gorgeous to be put in my mouth! That being said, "Get into ma tummy!" Oh that looks so decadent! It's lucky for me I'm so worth it! Thanks for sharing! I say you can never go wrong with chocolate. I had a double chocolate milk while mine were baking! I just finished making some chocolate cake but it looks boring compared to those. Every time that I come here, you are putting up some decadent chocolate recipe! You are driving me to go buy some Ben and Jerrys! LOL! You always have the yummiest looking recipes!!! Your blog is a danger to my attempts at dieting. These recipes make me so hungry! Happy (belated) SITS Sharefest, mama! You're really quite mean, you know. Now i have cravings. Oh, those brownies look wonderful. From one romantic to another here's to a very sweet Valentine's Day filled with hope, love and much happiness. These taste crazy good! Thanks for sharing. Happy Heart Day to you! OK, HOW in the world am I supposed to stick to my diet New Year's Resolutions if you post delicious things like this? And HOW can I get these things in my mouth ASAP??!! They look fantastic, maybe I'll try the recipe out on my cheat day! Thanks for stopping by my blog and commenting! Yes, Alan DOES have quite the sunglasses collection, doesn't he? LOL!! I'm checking my pantry now! I am drooling over these cupcakes! It's raining and I love to bake when it rains, so I am going to make these tonight! Thanks for the great recipe and Happy Valentine's Day! oh I do wish I could make anything that looked as good as that. I saw these in the Martha Stewart cookbook too, but decided it was too much work for me. I ended up doing something with buttercream and spent 5 hours anyway. Lol. Happy SITS Day! Those are really cute cupcakes. I like the idea of adding the brownie heart on top. Cupcakes are so in right now...but of course, you already knew that. Love your blog! It's almost noon, so perhaps I will just have a cocktail! So cute & delicious looking! Heck ya - a brownie and a cupcake? Now if that isn't just brilliant! I will take two, please! These look amazing and yummy. It's the best of both worlds. My hubby would be happy to get not only cupcakes but brownies. Yum yum yum yum! Those look so good. I din't get to make cupcakes this weekend, but maybe these will be in replacement of those ones. Because they look damn good! Much better than a standard cupcake - rockin'! definitely wish I had seen this before yesterday!! 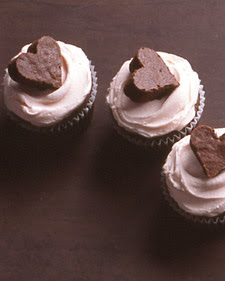 I'm going to have to just decree a heart-shaped-brownie-cupcake-day I think! happy belated valentines day!! I am definitely going to try these!